To establish a secure connection between the backup server and protected computers, Veeam Backup & Replication uses a TLS certificate. 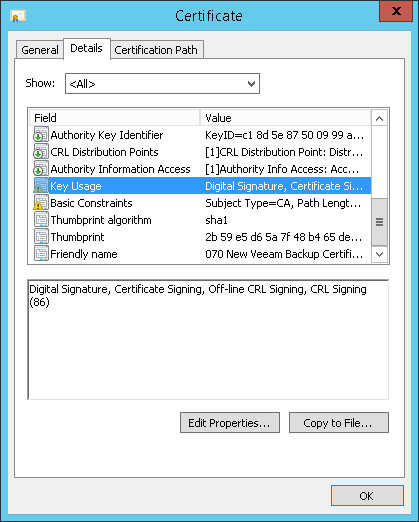 By default, Veeam Backup & Replication uses a self-signed certificate. Veeam Backup & Replication generates this certificate when you install the product on the Veeam backup server. Veeam Agents and Veeam Backup & Replication must trust the CA. That is, the Certification Authority certificate must be added to the Trusted Root Certification Authority store on the Veeam backup server and Veeam Agent computers. Certificate Revocation List (CRL) must be accessible from the Veeam backup server and Veeam Agent computers. [For Linux-based Veeam Agent computers] OpenSSL version 1.0 or later must be installed on the Veeam Agent computer. The certificate subject must be equal to the fully qualified domain name of the Veeam backup server. For example: vbrserver.domain.local. If you use Windows Server Certification Authority, it is recommended that you issue a Veeam Backup & Replication certificate based on the built-in "Subordinate Certification Authority" template or templates similar to it. The key type in the certificate must be set to Exchange. 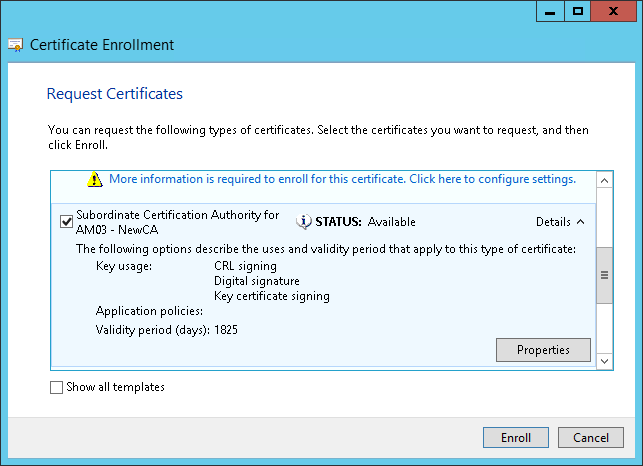 At the Request Certificates step of the Certificate Enrollment wizard, select a check box next to the necessary certificate template and click Properties. 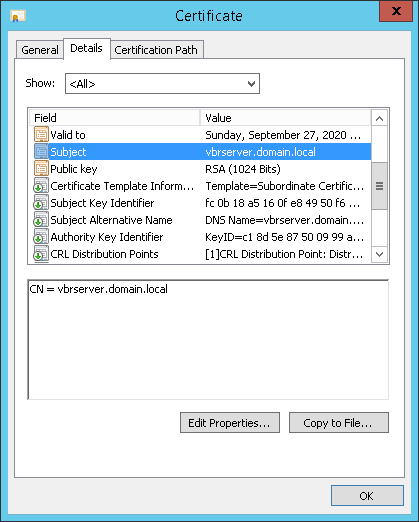 In the Certificate Properties window, click the Private Key tab. In the Key Type section, select Exchange. To start using the signed certificate, you must select it from the certificates store on the Veeam backup server. To learn more, see Importing Certificates from Certificate Store. After you specify the signed certificate in Veeam Backup & Replication, the during the next backup job session Veeam Agents will receive child certificates from the Veeam backup server.